I recently read a piece at The Gospel Coalition entitled Miscarriage and the Confusion of Sinful Grief. In it, Jamie Carlson talks about some of her sinful responses following a miscarriage. In it, she writes a fair bit about selfishness and the way that it played into her grief, making it difficult for her to rejoice in the pregnancy announcements of her friends, instead causing anger and jealousy at the good fortune of those who had what she did not. I can understand those emotions. In the months following Elliott’s death, several of my friends welcomed sons into their families, and the struggle to rejoice in those seasons is difficult. As I read through her words of self-condemnation, I remembered on particular exchange that the author may consider to have been sinful. About a month after Elliott’s death, my friends Maile and Shawn Smucker gave birth to their son Leo. The day of Leo’s birth, I had been following Shawn’s updates about Maile’s labor with mixed feelings. In some ways, I was happy for them to be going through this experience again, particularly after they had been through the pain of a miscarriage in the year before Leo’s conception. I was excited about the prospect of a new life, as we so often are when we hear of a baby being born. But I also felt the sting of inequity at that moment. They got to have their son and I didn’t. It was an ugly emotion, to be sure, but it was an honest one. Shawn messaged me right after Leo’s birth, telling me that he was praying for me and asking me how I was doing. In that moment, I could have been polite and told him that I was happy and just left it at that. After all, it was true. I was happy for my friends. But instead of being polite, I was honest. I told him that I was happy for him and that I was jealous of him. I told him I was okay and not okay. I also told him that his decision to reach out to me in the moments of his son’s birth meant a lot to me and helped me feel less of the bad feelings. 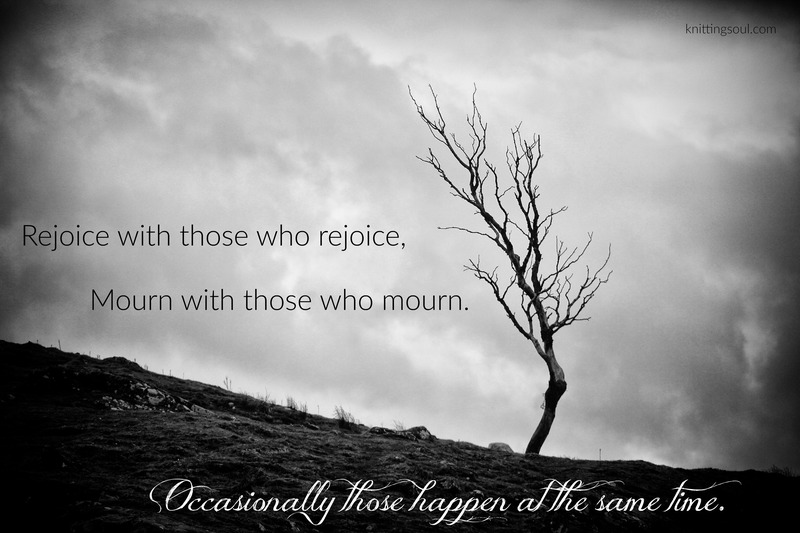 In the Scriptures, we’re told to rejoice with those who rejoice and to mourn with those who mourn. Occasionally those happen at the same time. If I had worried that I was sinning by telling Shawn my honest feelings in that moment, I would have robbed him the opportunity to mourn with those who mourned. And as he mourned with me in the midst of his own overwhelming joy, he allowed me the opportunity to more fully rejoice with him. By sharing my burden of grief, I was able to make space for joy. Grief is inherently selfish. Whatever loss we’re mourning, it’s not really about that person or event, but rather about our reaction to the loss. The sadness is about us and how we’re affected. Recognition that grief is selfish can cause us to diminish how we actually feel when we’re going through the dark times. We will downplay our emotions because we don’t want it to be about us when we know that something tragic has occurred. For many, that feeling of selfishness, even if we don’t immediately recognize it as such, will be enough to deter us from being honest about our feelings. But the survivors of tragedy are the ones who feel. We are the ones who have to continue on without the person in our life. We are the ones who must remember the stories. We are the ones who will suffer reminders as time moves forward. There is no way to avoid selfishness in our grief because grief is at its core selfish. But I think the way that selfishness can be most damaging is when we keep our grief hidden, when we allow guilt and shame to drive what we think others are able to handle. When we do that, our emotions fester and are more likely to result in eruptions of anger and hurt that damage other relationships. By choosing to be honest about our own pain, our own jealousies, our own selfishness, we give those emotions less power and as a result, less of an opportunity to do harm to us or to others. Trying to be perfect in our grief is a losing battle. By recognizing our selfishness and allowing ourselves freedom to express negative emotions, we defeat that same selfishness. By being honest in our mourning, we can find peace. My book Embracing Grief is now available for preorder! Order your copy at Amazon, Barnes & Noble, Apple, and Kobo. This entry was posted in Embracing Grief, Grief and tagged Embracing Grief, grief, miscarriage, selfishness, stillbirth, The Gospel Coalition. Bookmark the permalink. Pingback: My Grief is Selfish – NICOLE.YL.